‘Amazing.’ ‘Exciting.’ ‘Fascinating.’ ‘Reassuring.’ Bird-watching. 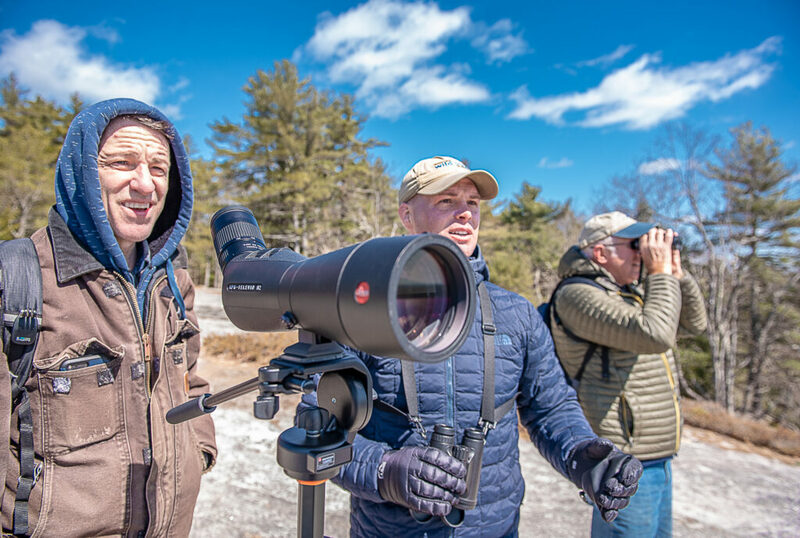 Like Zane Baker of North Yarmouth, most birders can recall the precise moment – and often the exact bird – that launched them headlong into the world of bird-watching. "It was like a highway of falcons, hawks, eagles. 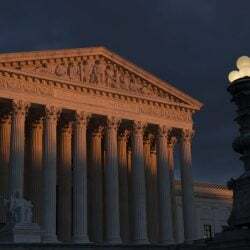 I just thought it was awe-inspiring. I fell in love with it." Whatever it was that flew across the windy skies over Bradbury Mountain, it was just a flicker of brown at the very outer reaches of my periphery. It was there one second, gone the next. To the untrained eye, it might have been nothing at all. “Osprey,” said Doug Boyd, my guide on this excursion. 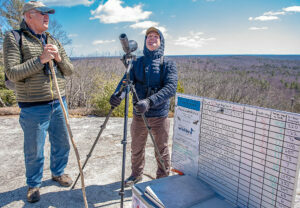 “Osprey,” agreed Zane Baker, who sets up on top of Bradbury Mountain six days a week to count birds flying in from the south. Doubt these guys? Not on your life. These are men for whom watching, identifying and studying birds isn’t just a hobby, it’s a way of life. For Baker, hired by Freeport Wild Bird Supply for the annual hawk watch, it’s a profession, and he dutifully entered that vague, fast-flying osprey into his daily bird inventory. A few minutes after the osprey came and went, Boyd spotted a pair of high-flying birds through his binoculars. Baker, adjusting his own scope to focus in on the same section of sky, pulled the birds into view in bare seconds. 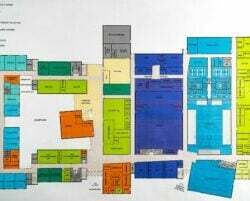 I took a look and, what do you know? Perhaps a mile away, a pair of birds negotiated the wind currents with such elegance and ease, it was downright majestic. For nearly 15 seconds, I gazed in awe at them. So magnificent. So dignified. “Eagles?” I asked the experts at my side. And like that, I had a new favorite bird. Turkey vultures, fairly new to this area, may be ungainly creatures best known for munching on roadkill, but I’ve come to love them. Beauty, my friends, is in the eye of the beholder. On the ride back from Bradbury Mountain, Boyd pointed out several birds along the Androscoggin River. A Canadian goose here, a mallard over there and couple winged beauties whose names I have since forgotten. I was new to this birding game, but I had already beheld an osprey and a pair of glorious turkey vultures. I figured I was ready to start identifying birds on my own. Boyd was most sympathetic when he explained to me that there are really no such things as “seagulls,” taxonomically speaking. There are various species of gull, he said, but none that are classified as “seagulls,” which is merely a layperson’s name for those birds best known for stealing your fries at Old Orchard Beach. And so I had learned yet another fact about birds. And as I would come to understand, bird-watching is all about learning. It’s a pastime that can never be mastered, as anyone with decades of experience will tell you. 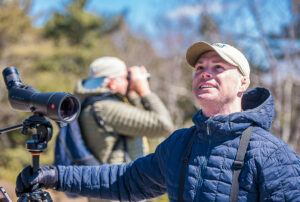 Most birders can recall the precise moment – and often the exact bird – that started their journeys of learning and launched them headlong into the world of bird-watching. For Dan Marquis, it began 30 years ago when he became curious about the birds gathering around his feeder. The bird in question? A yellow-throated warbler. Sam Boss, 32, had no choice but to get interested in birds – as a toddler, his bird-watching parents insisted. Dr. Dana Little, 64, has been all over the world on bird-watching excursions, but his passion for it was born out of a simple childhood gift. 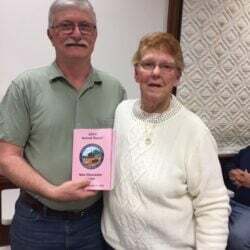 On a cold afternoon in early April, I headed over to the University of Southern Maine’s Lewiston campus for one of the Stanton Bird Club’s monthly meetings. It was a downright frigid Monday and I didn’t expect that many would have turned out for a talk on “The Impact of Drought on New England Trees,” but there they were, a room full of birders with notebooks in hand. Dozens came for the meeting, and I was told that’s not unusual. Stanton has 300 or so members, and by and large these are not casual bird-watchers. They keep meticulous lists of the birds they’ve seen, fastidiously tracking dates and times and locations. They study bird characteristics down to the finest detail and familiarize themselves with sounds, songs and mating rituals. Many of the club members have been all over the world on bird-watching trips. Boyd is one of those. In fact, he just recently returned from a trip to Texas where he clapped eyes on a number of whooping cranes. That’s no easy feat, considering the cranes were near extinction with only 50 of the birds estimated to exist. And once he beheld the whooping cranes in their natural habitat, Boyd added that experience to his notes. Like most birders, Boyd says he looks for birds no matter where he is, whether he’s in some exotic country on the other side of the world, or hanging out on Bradbury Mountain with a clueless news reporter. And like most birders, Boyd says the passion for birds isn’t one that has an expiration date. There’s always more to learn and more to see. His favorite bird? Spoiler: It’s not the turkey vulture. Jeri Maurer, president of the Stanton Bird Club, has been birding most of her life. To Maurer, it isn’t always about what a bird looks like or what song it sings. It’s about their habits, about migration and what birds can teach us. Dr. Little hears that. With so many Southern and Midwestern birds suddenly appearing in New England over recent years – cardinals, Carolina wrens, red-belly woodpeckers, black vultures and the like – it’s hard not to believe that birds have something to tell us about the world. But don’t go believing that it’s all scientific for the local bird fans. Just about all of them will admit to a more personal, and even spiritual, connection to birds. Little, for instance, is comforted by the woodcock, which recently arrived back in his neighborhood after riding out the winter in warmer places. Ask Marden why the chickadee is her favorite bird and she’ll tell you a story about a bitter cold morning during the Ice Storm of 1998. Maurer has a special fondness for sandhill cranes, which typically stay on a Midwestern flight plan, after the birds began appearing in her neighbor’s field in Leeds in 2003. The cranes weren’t her first bird loves, however. That happened decades earlier when she set eyes on a long-tailed beauty with a descriptive name. 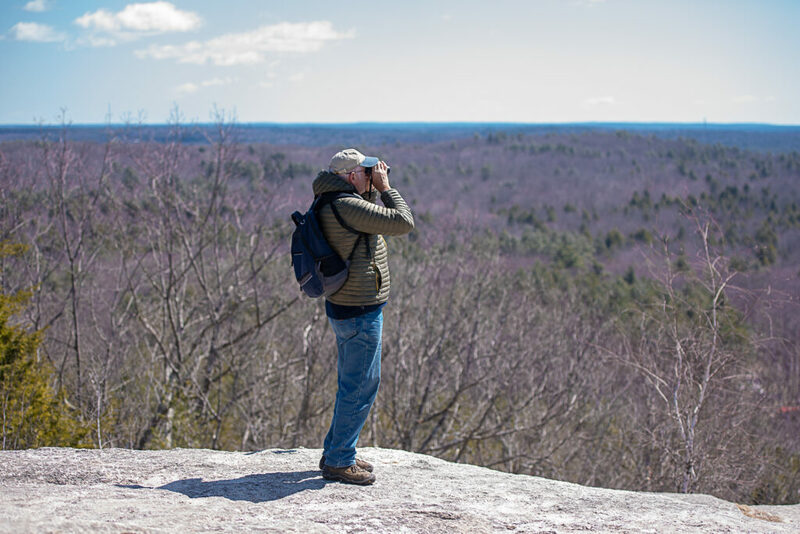 Baker, 34, of North Yarmouth, wasn’t always the official bird watcher atop Bradbury Mountain. Before that, he was just a guy who stopped in at Freeport Wild Bird Supply in 2012 and got curious about birds. He was curious enough to go on a couple of bird walks, but it was a trip to Bradbury during peak migration season that really hooked him good. In was up on that windy mountain where Baker beheld a sky full of birds coming up from the south all at once. Of course, some days are better than others on the mountain. The day I went up, the wind was fierce, and other than those two distant vultures and that one blurry osprey, there were no birds at all to be seen. Just a few days earlier, according to Baker’s notes, it was practically a carnival of birds out there. That’s the thing about bird-watching: It requires a good deal of patience. Some days you get the carnival, other days, all you get is wet and cold. The Stanton Bird Club, meanwhile, is also focusing on the next generation of bird-watchers. In its Junior Nationalists program, the club seeks to teach elementary school aged kids through a variety of nature-related activities, including field trips to the club’s Thorncrag Bird Sanctuary in Lewiston, where nature is abundant. Boss, the Community Engaged Learning coordinator at Bates College, works with the bird club on that end of things. He knows it pays to teach children about nature at that age because he’s witnessed the enthusiasm of his own children. Of course, with the digital age upon us, one doesn’t have to crouch in the wet bushes for eight hours to spot the most intriguing birds the area has to offer. Birds are well represented on the World Wide Web, as well, particularly in online clubs like the Maine Birds page on Facebook, which boasts more than 22,000 members. If the birds aren’t flitting right outside the window to entertain you, have a gander at that Facebook page and you’ll at least get to see what your neighbors are seeing. Here’s an immature red-tailed hawk practically posing for pictures in Winthrop. Here’s a fit-for-framing close-up of a song sparrow in Scarborough, and an American woodcock lounging in somebody’s yard in Albion. Some people post photos of birds they need help identifying and some post pictures and videos of birds doing zany things – like the dark-eyed junco that appears to be dancing on the snow and the unidentified bird plucking fur from a sleeping dog. Many of the members of the Maine Birds group are also members of the Stanton Bird Club. These are people who just can’t get enough of birds. And as I talked with more and more of them, I began to understand their passion for birds. 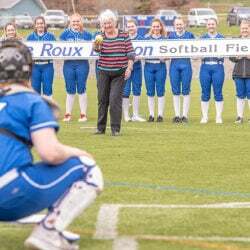 The enthusiasm is infectious and it’s enviable – how many hobbies are there that can be enjoyed pretty much anywhere on earth and at any time of year? Am I ready to take to fly beak-first into the thrilling world of serious birding? I probably would, if not for the sad fact that most birders do the bulk of their watching in the early morning hours, which is when the creatures tend to be at their most active. Have you ever seen me in the morning? I’m reminded of my new friend the turkey vulture. That’s me in the morning, all right. In fact, now that I think of it, maybe I’ll find myself a nice owl or other night bird and get acquainted.